Irish Perrier-nominated comic Ed Byrne is best known for his observational style. Hugely popular and critically acclaimed on the stand-up circuit, he has toured across the UK and Ireland, and at venues all over the world. His Edinburgh Festival shows invariably sell out. Audiences lap up his chatty style, full of anecdotes and which occasionally veers off into innovative ideas and threads. A guest on a string of panel shows from Mock the Week to Have I Got News for You, Byrne has also done film work and been appearing on our screens since he was a teenager, when he had a role in Father Ted. He has acted in ITV’s Christmas pantos, presented TV’s Uncut! Best Unseen Ads and famously had a custard pie thrown at him by Robert Downey Jr on a Graham Norton programme. This summer, he appeared in a pilot for the BBC comedy drama Reunited. Trying to separate cigarettes and alcohol, that’s against God’s will! Do you know who I like? No, you don’t. So I’m gonna tell you. Because if you did know who I like, that would have been weird – it means you’re in my head. I thought about giving up smoking, but decided not to – I’m not a quitter. Everyone’s got their own reasons to dislike Americans, ‘aluminum’ is top of my list. Aluminum cans, aluminum – what the f**k’s aluminum foil? Everyone knows it’s pronounced ‘tin’! Sometimes you should say the right thing. But the wrong thing is funnier. My problem with the Grand Canyon is Americans are too proud of it for my liking. The Grand Canyon was like that when they found it! And it’s not like it was hard to find. I know that every cigarette I smoke takes five minutes off my life, but it takes ten minutes to smoke it. That’s a five-minute net gain! 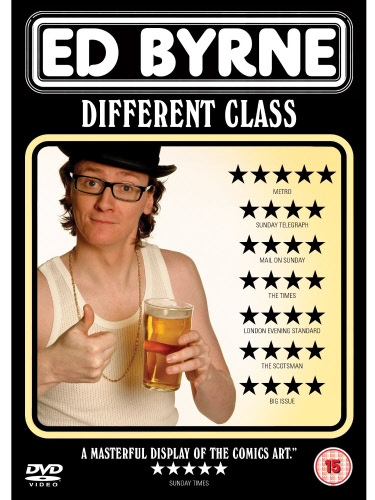 Ed Byrne tours Scotland before Christmas 2010, and his DVD, Different Class, is out now.